What's more terrifying than going to a haunted house where they put a plastic bag put over your head, drag one of the people in your group into a bathroom, and leave you in a pitch black room with dudes grabbing you? Going to seven haunted houses where they put a plastic bag put over your head, drag one of the people in your group into a bathroom, and leave you in a pitch black room with dudes grabbing you (plus other stuff that doesn't sound potentially arousing). 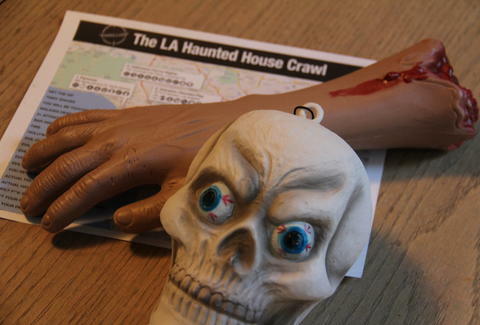 Luckily, you can now totally do that thanks to Thrillist's exclusive, printable map of the best LA Halloween attractions, set up so you can drive to all of 'em in a single night. That's not all: each one's been vetted, so they're labeled w/ important stuff like which ones have bars, which have zombies, and, um, which ones have bars, so hit the link below and print it out before we put a plastic bag put over your head, or maybe a pillowcase, because plastic's bad for the environment.